somebody else MUST remember this too? When I was really little – and I’m thinking that this was when my granddad was still alive, so I’m talking like 5 years old and younger – I remember that there was a very special treat that we only got at my grandparents’ house: Donald Duck Juice. But was there even such a thing as Donald Duck Juice? Did I imagine this? How come I’ve never seen it or heard of it since then? Was it just a silly name that my grandmother made up for our benefit? Then yesterday, I was at the grocery store, looking for citrus juice because it’s another crazy pregnancy craving I’m having (pineapple, grapefruit, orange juice… I want them ALL). Lo and behold, I did a double take, and I almost burst into tears right there in the juice aisle. Donald Duck Juice. It actually exists. Sure it’s in cans instead of bottles now, but that is the stuff. I didn’t care that it was $3 for a 6-pack of tiny cans, I bought them anyway because dude, that is a piece of my childhood right there. When I went to check out, the cashier was an older guy in his 40s, and he said, “Wow, they still make this stuff? I haven’t seen it since I was a kid!” I was all, “I KNOW!! Can you believe it?? ?” I think I might have freaked him out with my Juice Enthusiasm. I called everyone in my family afterward – my parents both remembered it, but my sister didn’t remember it at all and my brother only barely did. So weird, the way our memories work and the things that stick with us throughout the years. This entry was posted in Food, Shopping and tagged Donald Duck Juice, food cravings, Marketing, pregnancy by Cindy. Bookmark the permalink. I do, I do! Only they didn’t carry it in Jackson and we only had it at *our* grandmother’s house up north! Pulp-free OJ, before that was everywhere! @Susan @Whymommy, Yay! I’m not crazy! Maybe that’s why we never had it at home, because it wasn’t available in Jackson? My grandparents lived in Meridian, so I guess that might explain why we only had it there. Can’t help you on this one. 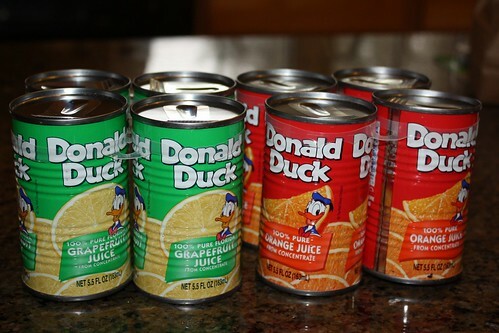 I’ve never heard of Donald Duck juice, but I will be looking for it next time I’m at the grocery store. I’ll keep you posted. @AmazingGreis, It’s made in Florida, apparently. I don’t know if it’s available in Texas or not, but happy hunting! We have Donald Duck juice here in Ohio. @Mandi Bone, Really? I thought it was a Southern thing, but clearly not. How strange! I don’t remember it either, but then, my parents only let us have powdered skim milk and orange juice from frozen concenrate made with twice the water. Because they were cheap *and* weird. I don’t remember it was a kid but we have Donald Duck Orange Juice in cartons here in Washington. @Linda, Seriously?? How on earth did I never notice it in the 7 years I lived there?! Crazy! @Cindy W, I think it’s new here. I’ve just noticed it in the last year or so. I’ve only seen at Top Foods. I remember it. It was something only my grandpa had though. No clue where he got it. I thought it was pineapple/orange juice but I was seriously little when I had it last. I SO remember DD orange juice! It was what my grandparents always had at their house, and I stayed with them for a week every summer…I thought that stuff was the best thing ever. I TOTALLY remember it. But I also remember it always being in cans. It also came in frozen concentrate form.